After over a week of turmoil, Baltimore state’s attorney Marilyn Mosby announced on Friday that six officers will be charged for their alleged involvement the death of Freddie Gray. In front of a crowd of press and on-lookers, Mosby announced that there is “probable cause to file criminal charges” against the police people who were allegedly involved in the arrest and transport of Gray in a police van on April 12. The 35-year-old prosecutor also revealed during the press conference that Gray had not committed a crime, claiming that the cops' arrest of Gray was illegal. 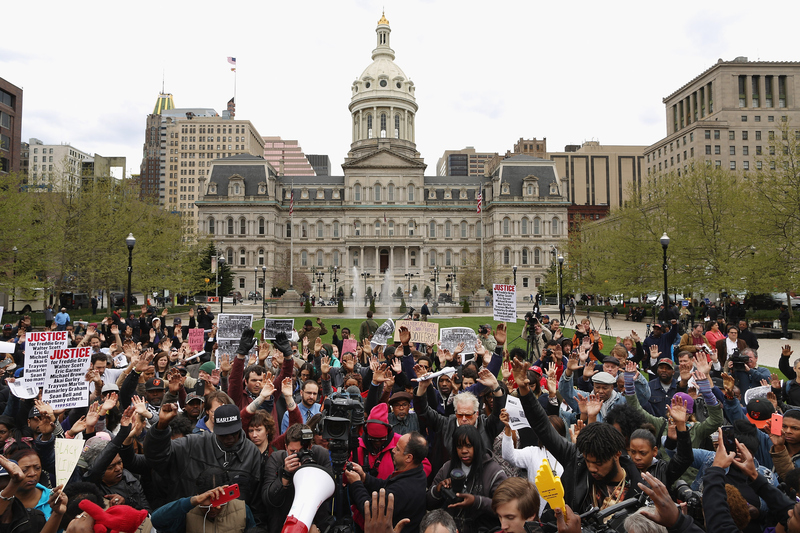 So, who are the officers charged in Freddie Gray's case? There are six in total, and they face serious charges. The prosecutor's office released the names of the six people alleged to have contributed to the death of 25-year-old Gray. They are: Officer Caesar R. Goodson, Jr., Officer William G. Porter, Lt. Brian W. Rice, Officer Edward M. Nero, Officer Garrett E. Miller, and Sgt. Alicia D. White. Warrants for their arrests have been issued. Officer Caesar R. Goodson, Jr.: Second degree depraved heart murder; involuntary manslaughter; second-degree assault; manslaughter by vehicle (gross negligence); manslaughter by vehicle (criminal negligence); misconduct in office.Officer William G. Porter: Involuntary manslaughter; second degree assault; misconduct in office.Lt. Brian W. Rice: Involuntary manslaughter; two counts of second degree assault; manslaughter by vehicle (gross negligence); two counts of misconduct in office; false imprisonment.Officer Edward M. Nero: Two counts of second degree assault; manslaughter by vehicle (gross negligence); two counts of misconduct in office; false imprisonment.Officer Garrett E. Miller: Two counts of second degree assault; two counts of misconduct in office; false imprisonment.Sgt. Alicia D. White: Involuntary manslaughter; second degree assault; misconduct in office. A wanton and willful killing. The term "depraved heart" means something more than conduct amounting to a high or unreasonable risk to human life. The perpetrator must realize the risk his behavior has created to the extent that his conduct may be termed willful. Moreover, the conduct must contain an element of viciousness or contemptuous disregard for the value of human life which conduct characterizes that behavior as wanton. According to NBC News, Goodson, Jr. has been a member of the Baltimore police force for 16 years and is 45 years old. Porter is 25 years old, and has been a member of the force since 2012. Rice, 41, has been a member of Baltimore PD since 1997. White, 30, has been there for five years; Miller, 26, has been there since 2012, and Nero, 29, since 2012, as well. The Baltimore Sun reports that as of Friday morning, it is unclear where the six officers are. A spokesman for the department of Public Safety and Correctional Services said, "We're not sure what time they are coming in. They will go through the process like anyone else." UPDATE: As of Friday around 1 p.m. ET, The AP reports that according to the city's mayor, five of the six officers are now in custody. Now, that's left for the court to decide.